Samford University’s Beeson Divinity School added 29 new graduates to its alumni roster after commencement and consecration services on Wednesday, May 6. The Class of 2015 includes Bruce Persons, the first deaf Master of Divinity graduate in Beeson’s 27-year history. The graduates were urged to go forth and “set an example for a lifetime” by speaker Travis Coleman, senior minister of First Baptist Church in Prattville, Alabama, and president of the Alabama Baptist State Convention. Christians today live in a world with many challenges, said Coleman, who drew from the Apostle Paul’s writings to Timothy for advice on how to navigate these unique times. To set an example for a lifetime of good personal responsibility, he said, practice leads to improvement. “If you want to preach and teach, you’ve got to preach and teach,” advised Coleman, who said that now in his 41st year in the ministry he still goes to the church each Saturday to practice his sermon. “Not to be letter perfect, but to let God’s word sink into me in his house,” said Coleman, who has served as a pastor in Alabama and Florida. Coleman encouraged members of the Class of 2015 to persist and never give up trying to set an example for a lifetime. In doing so, he said, they will help others avoid the consequences of sin and bad decision making. 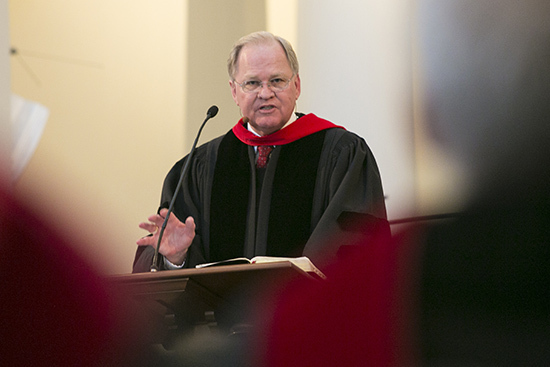 The program in Andrew Gerow Hodges Chapel included a consecration service along with the traditional awarding of diplomas, a combination that Beeson Dean Timothy George says underscores Beeson’s commitment as a center of learning as well as a community of faith and prayer. During the consecration service, each Beeson faculty member prayed individually for each student in a special time of hands-on blessing. The Class of 2015 includes four Master of Arts in Theological Studies graduates, 23 Master of Divinity graduates and two Doctor of Ministry graduates. Along with their diplomas, each graduate also received a copy of the Holy Scriptures. And in keeping with Beeson tradition, Bibles are being sent to an unreached people group in honor of the new graduates. This year, 29 Bibles in the Azeri language are being sent to Azerbaijan, where a recent Beeson graduate has served and has ties. Persons, who has been deaf since early childhood, graduated not only with a diploma and Bible, but with the deep respect of Beeson faculty, staff and students. On Tuesday prior to commencement, he received the school’s Distinguished Student Award in recognition of outstanding and holistic achievement in scholarship, Christian spirituality and ministry involvement. Persons, who hails from Maryland, served as Beeson’s 2014-2015 student body president. He says his immediate plans are fluid, but he knows his calling. “I am called by God to preach the gospel and minister to the deaf and hard of hearing community—the fourth largest unreached people group in the world,” said Persons, who pursued his Beeson studies with the aid of a devoted group of interpreters for the deaf. Persons, who holds a bachelor’s degree in management from Hood College, would also like to pursue a doctorate degree someday. Beeson’s commencement and consecration service was the first of seven Samford graduation programs planned for this month. Click here for a complete schedule of the May 14-16 exercises and other activities.